As we come in to the dry season activities are starting to increase rapidly for St John Ambulance Australia (NT). All of our people, volunteers and employees, are starting to plan for the community events that are so important to our fabric as well as the much larger events such as the Darwin V8s and Finke that shine a light on the Northern Territory. These are important activities for us, as providing first aid and medical services to ensure the safety of our community is at the heart of what we do. The National Members Convention for St John Ambulance Australia will be held in Canberra in the first week in May. Attending this event will be Frank Dunstan, Richard Morris Award Winner for the Greater Darwin Region, in recognition of the hard work and effort he puts into the Vollie News and his overall contribution to St John Ambulance Australia (NT). Ben Rowley, the recipient for the Richard Morris Award for the Regional Award is unable to attend with us but we thank him for his fantastic service. The Convention brings together all St John Ambulance services across Australia and New Zealand to share and celebrate what we do as an organisation. Our First Aid in Schools program continues to be an important focus for what we do and our trainers have recently completed some remote trips to places such as Mataranka, the Jilkminggan (Jilk for short), Tjuwanpa (chu-wun-pa) Hermannsburg and Ntaria (Na-daria) community schools to ensure we try to reach all of our Territory communities. Exciting for us is the rapidly approaching completion of our Alice Springs Volunteer and Training Centre, built for sustainability of our volunteer services into the future in Alice Springs. On 25th April, Anzac Day, our people were well represented at dawn services and marches across the Northern Territory with a number of our people laying commemorative wreaths on this important day. A large number also participated in the Walking off the War Within Challenge on April 28th in Darwin and Alice Springs with Emergency Service Personnel, Defence Force Personnel and members of the public in support of Post-traumatic Stress Disorder. From everyone at St John Ambulance NT we would like to extend a heartfelt farewell to Pat Murray, who has been a valued member of the St John Ambulance family for almost 20 years. We would like to thank him for his contribution to the St John Volunteers and Ambulance Operations in varying roles. Though he is now taking some well-deserved leave, we are fortunate in that we will still see Pat out and about in the future as he will be continuing his journey with St John Ambulance NT in the role of a Volunteer. Thank you again Pat for all your hard work and best wishes for the future! 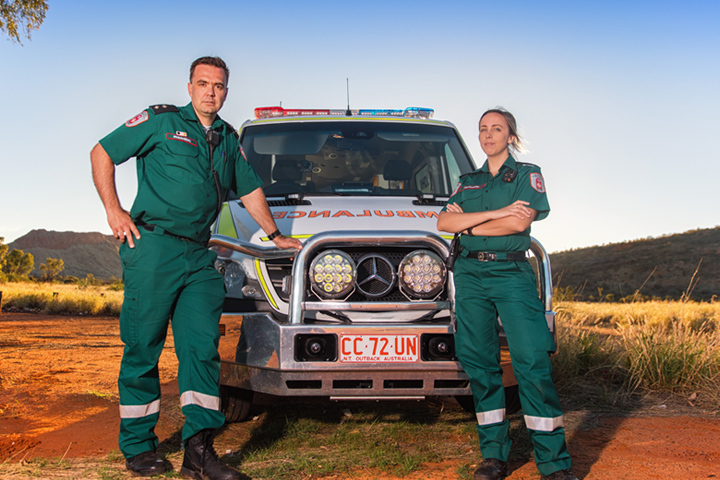 This month we were excited to attend the Rural Outback And Remote Paramedic Conference (known as ROAR) organised by Paramedics Australasia, an important event for us and other Paramedics from around Australia and New Zealand. The conference was a fantastic opportunity to network, share latest news and updates in the field, as well as hear presentations from key individuals and take part in lively panel discussions and practical demonstrations. A big thank you to the organisers of this fantastic event. On Anzac Day 2018, Territorians of all ages marked the special day by attending one or more of the many memorial services held around the Top End. From Darwin to Alice Springs, thousands gathered before sunrise– 103 years after Australian troops landed at Gallipoli. The City of Palmerston, City of Darwin and Litchfield Council hosted a range of events to recognise the important day, including breakfasts, dawn services and marches. In Darwin, crowds of people walked to the Cenotaph, with military tunes from the Australian Army Band adding to the atmosphere. St John Ambulance NT Cadets and Volunteers were proud and humbled to participate in various activities throughout the day, including wreath laying at the dawn service and marching through the streets of Darwin City alongside our colleagues in the emergency services and armed forces. It was a fantastic opportunity for us all to remember those who have served and continue to serve our community. We at St John Ambulance NT would like to congratulate Julie Murray and Mel Crompton (pictured). After seeking two important roles to oversee the entire future youth movement in St John Ambulance NT, we were very pleased to appoint Julie, now Territory Officer of Youth and Mel, Youth Support. Both have been St John Ambulance Cadets previously and as such have a thorough understanding of Cadet life, as well as having already obtained their Grand Priors badge; a significant achievement in itself. Well done again to Julie and Mel and best of luck in your future roles.